Standard, Target, Hunter, Competition, Tactical, and all 22/45 TM models. Disassembly, cleaning, lubrication, and reassembly for all models. • 26 pages & 69 high-resolution grayscale images. • Exploded view and numbered list of all 74 parts for the RUGER®, Mark IVTM and 22/45TM models. Please checkout the Table of Contents and Sample Page images. In September 2016, Ruger Perfects Rimfire - Again: Introducing the One-Button Takedown Mark IV. NEW KEY FEATURES: A recessed button in the back of the frame allows the barrel/receiver assembly to tilt up and off of the grip frame without the use of tools for a quick and easy field-stripping and proper chamber to muzzle cleaning. Ergonomic bolt stop and an ambidextrous manual safety which can be converted to left-side only. 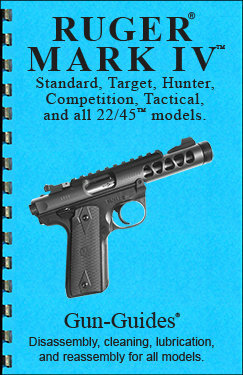 Magazines drop free for faster reloading and are compatible with MARK III series pistols. 22/45 series have a unique base plate. A new one-piece grip frame is machined from a solid piece of stainless steel or aluminum and internal improvements include changes to the hammer, sear, bolt, and firing pin for smoother, more reliable feeding. All references to RUGER®, Mark IVTM and 22/45TM Pistols are trademarks of Sturm, Ruger & Co., Inc. Gun-Guides and this publication are not affiliated with or approved by Sturm, Ruger & Co., Inc. Gun-Guide™ and Gun-Guides™ are registered trademarks of Gun-Guides, LLC.